Grounds at Carneros Inn in Napa Valley. Courtesy of Bergine.com. What’s one good thing to have come out of the recession? The launch of various discounter web sites catering to those of us still seeking a little luxury on a tighter budget. I’m loving newcomer Bergine.com, which delivers a new deal on local health, beauty, food, travel and other lifestyle services to my inbox every morning. Founded by Bay Area entrepreneurs Patricia Calfee and Ian Picache, the site offers 24-hour sales for luxury services in San Francisco, Los Angeles, and New York at up to 60% off the regular retail price. Quantities are limited and a countdown begins as soon as a deal gets posted. 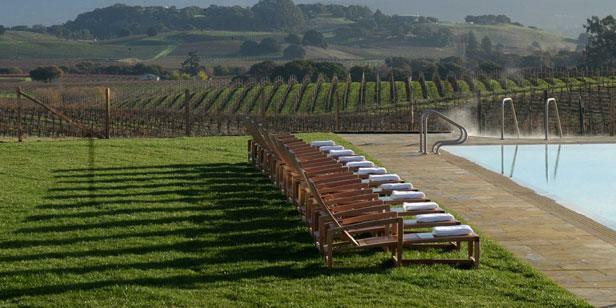 In the past 48 hours since I signed up (no membership fee is required), I’ve been offered a couples massage and day access to the beautiful grounds at Carneros Inn in wine country ($350 marked down from $450), and a three-course dinner for two with wine pairing at Maverick for just $90 (worth $162). The deals make great gifts for friends and family who appreciate the atypical, more experiential presents. And for those of you who are known to be impulse buyers, never fear: Bergine has a 24-hour post-purchase return policy.